The results? The Pacers blitzed the Raptors early to a first-quarter lead of 28-14 and never looked back as they tied the series at 2-2 with a 100-83 victory. The two biggest benefactors to the Pacers devotion to sharing the ball were Ian Mahinmi and George Hill, who went from scoring 40 points combined in the first three games to scoring 44 points combined (a team-high 22 points a piece) in game four as they both had perhaps their best games of the season. Mahinmi on career night: "Right on time. Most importantly, it's a win. We tied the series. It's a good night." 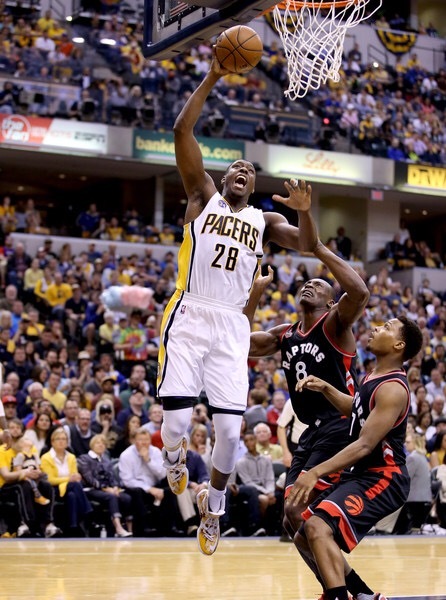 Mahinmi ended up with a career-high 22 points, 10 rebounds and a career-high 5 assists. Oh, and he did all that while playing with an injured back. Mahinmi didn’t elaborate on his routine with the trainers to get ready for the game when he was asked, but did say he was glad to have the extra day in between games and will spend a lot of time with the trainers. One adjustment that opened up the paint for Mahinmi was Vogel reinserting Myles Turner back into the starting lineup. Even though the 20-year-old rookie struggled with his shot, hitting only 2 of 13 shots, the Raptors still had to respect his scoring ability a lot more over Lavoy Allen, who went from starting to not in the rotation. The much-maligned all bench lineup that struggled in the first three games was gone in game four as Vogel inserted Mahinmi along with Lawson, Rodney Stuckey, CJ Miles, and Solomon Hill. In game three the all-bench lineup added 10 points to the deficit in 5 minutes of the second quarter, but in game four the bench lineup with Mahinmi as the anchor increased the Pacers lead by 5 points over the first 5 minutes of the second quarter. A big shift in a stretch that has hurt in the Pacers in the first three games. Mahinmi has shown vast improvement this season in all aspects of his game this season (he received three 3rd-place votes for Most Improved Player, which is no small feat for a defensive center in his 8th season), and yesterday’s game showed off all those areas where he’s improved to a national audience. That defensive punch showed up against the Pacers toughest challenge so far in the series: Lithuanian center Jonas Valanciunas. After dominating on the glass in the first three games, Valanciunas only managed 6 rebounds in game four.